the license of VMware vSphere 5.1 includes the diskbased Backup Solution VDP(vSphere Data Protection). So I’ve decited to try the appliance (Version 5.1 Timestamp 2012-10-02) whether these meets our requirements. The DNS forward and reverse resolution of the choosen name and IP address is possible. The User, who manage the backup, have vCenter Administrator rights. Downloading and installing of the appliance works as expected. The Appliance is properly registered in the vSphere Webclient but I can’t start the VDP Frontend within. Error: Could not connect to the requested VDP appliance. 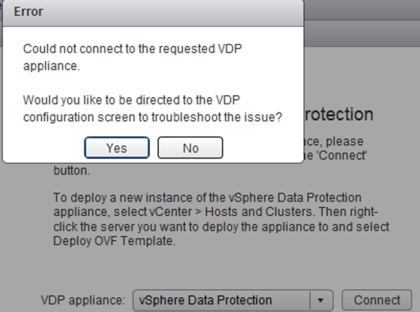 Would you like to be directed to the VDP configuration screen to throubleshoot the issue. also another Domain Login can connect. Something in the chain Windows Domain, Single Sign On, vCenter and VDP Appliance fails.